Natasha Marin and soprano Nicole Taylor have created a program of works by Debussy, Hahn, Liszt, Schoenberg, Strauss, Tchaikovsky, Weill and African-American Spirituals. Nicole Taylor has earned her DMA degree from UCLA under Vladimir Chernov. She has been appointed a 2012 Arts Envoy by the US Department of State. 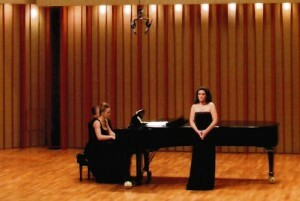 Natasha Marin and Nicole Taylor have performed together in the US and in Austria. Natasha Marin and acclaimed French soprano Nicol Mecerova have created an extensive repertoire of rarely recorded European vocal music. Natasha Marin accompanies soprano Nicole Taylor on a replica of 1840 Graf fortepiano for which Schumann wrote Frauenliebe und Leben.